The Xperia mini uses the traditional droid Gallery, which hasn’t really seen much change in Gingerbread. It has good functionality, cool 3D looks and nice transition effects, but unfortunately only shows a downsized version of your images. The different albums and folders appear as piles of photos, which fall in neat grids once selected. If you have online albums over at Picasa those show up as separate stacks as well. Alternatively, your photos can be sorted by date with the help of a button in the top right corner, which switches between grid and timeline view. In grid view, there’s a date slider, which can also be used to find photos taken on a certain date. The gallery supports finger scrolling or panning so you can skip images without having to return to the default view. Just swipe to the left or right when viewing a photo in fullscreen mode and the previous/next image will appear. Thanks to multi-touch support pinch zooming is also available here. The Android gallery still shows only downsized version of you images, though if you send one from here the full-res shot is received on the other end. Sony Ericsson have added support for Facebook albums too. They are set apart by a small Facebook logo and when viewing individual pics from that album, you can "like" them with the thumbs up button in the upper right corner. There is no dedicated video player app on the Xperia active as in most of the droids out there. Fair enough, maybe a fancy UI for picking a video is not that important, playing videos is what really counts. Well, that’s another disappointment – the video player supports only 3GP and MP4 videos. To its credit, the Xperia active did play a 720p MP4 video though (it records 720p videos, so it's expected to). The 3” HVGA Reality screen isn't what you'd call movie-watching material but it gets the job done. You can of course download a capable video player off the Android Market and make your life easier. The music player on the Xperia active is quite the looker. The interface is laid out in four tabs for the available sorting options: all artists, all tracks, playlists and albums. Altough it is an Xperia device you'll find no differences with the Walkman line of products. The only available visualization is the album art. If you hit the menu key you’ll get send and delete options. There is also a dedicated search bar at the top. The Now Playing screen offers nothing but the standard music controls, shortcuts to the library, the current album and the Infinite key, which allows you to quickly look up a song or album on YouTube. The music fans will appreciate the equalizer: it’s a rich selection of presets. One or two custom slots would’ve made sense – after all the player needs something to justify its Walkman badge. The xLOUD audio enhancement is a setting that ups the loudspeaker volume. It’s not exclusive to the Xperia active – all of the Xperia smartphones have it too. The Sony Ericsson Xperia active did pretty well in our traditional audio output test. The first part of it anyway, as we couldn't connect the Y-adapter we needed for the second part, due to the specific design of the 3.5mm jack. Anyway, we are pretty sure it share the audio bits with its Live with Walkman cousin, so you can check the score of that one for performance under load. with the smartphone connected to an active external amplifier, the Xperia active had nothing but excellent scores to show us. 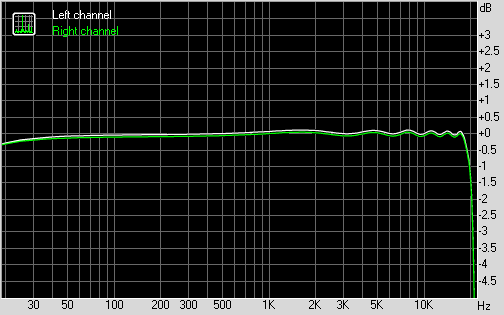 Its frequency response was spot on, the distortions were kept well under control and there was practically no stereo crosstalk. There's certainly nothing to be unhappy about here. 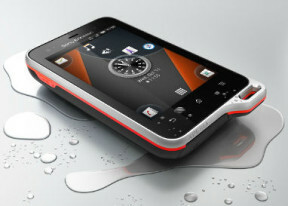 The Sony Ericsson Xperia mini is also equipped with an FM radio, which has a really neat and simple interface. It automatically scans the area for the available stations and places “notches” on the frequency dial to make skipping to the next station easier. Or, you can mark some of the saved stations as favorite. The TrackID service for song recognition is also available and works within the radio app.